Aden Soto-Ulev (right, UFA) scores against Soren Llido (OC Div.) in Y10 foil action at the SoCal Musketeers RYC, Sept. 23, 2017. 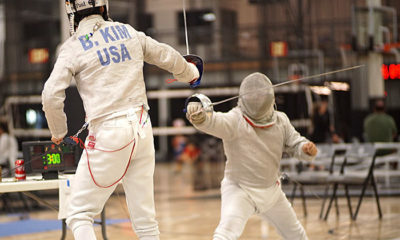 Before your child can compete in any tournament, he or she must have a USA Fencing membership. 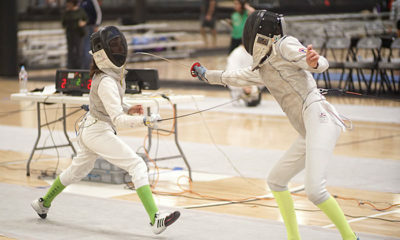 Most clubs have USA Fencing sanctioned tournaments that take part in the USA Fencing insurance program. You will be asked for proof of membership when you arrive at each and every tournament. 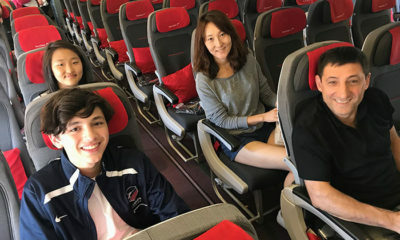 You will also need a proof of age for your child at a tournament, until you are able to have USA Fencing verify the age, so be sure and have a copy of a birth certificate when you go to tournaments. Individual Competitive Membership costs $75 a year. Here is the link to sign up. The current best website for upcoming tournament information is AskFred. 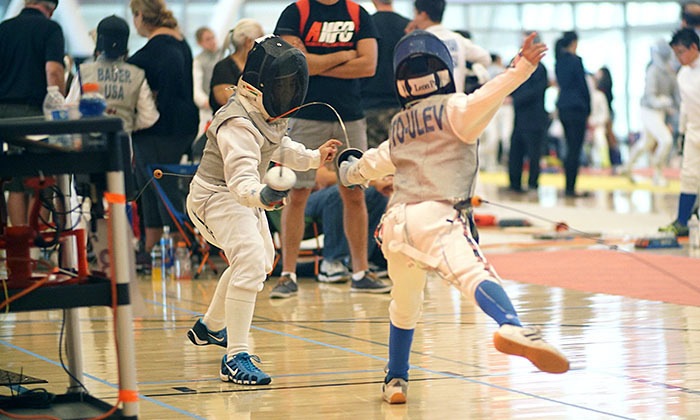 Many local clubs have “unrated” tournaments – these are typically tournaments for younger or beginner fencers. 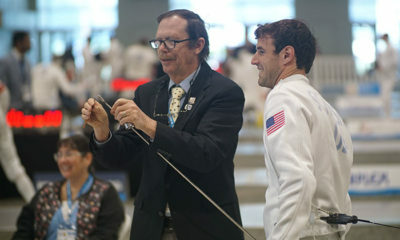 Some of the local clubs have a series of tournaments with fencers earning points each time they compete in one of the series. Those points are added together for some kind of prize at the end for the top points winner, typically a medal or trophy. These local tournaments are great for new fencers for a number of reasons. The North American Cup Tournaments are a series of tournaments organized by USA Fencing (Y10, Y12, Y14, Cadet, Junior, Div I, Div II, Div III, Vet Open, Vet Age, Wheelchair, and Cadet/Y14/Junior/Senior Team). NACs rotate through cities across the country. You can find more info on the USA Fencing Website.